Cryosurgery (Cryotherapy) is the local application of extreme cold for a controlled destruction or removal of abnormal or diseased tissue. In the past years innovations in the methods of application of the cryogen have made cryosurgery a preferred surgical treatment option for veterinarians to use on their patient animals. More portable, easy to use hand-held devices, such as the CryoIQ®, were developed to give the veterinarian the possibility to treat skin lesions with accuracy and efficacy, either in their office or in the field. The freezing of the tissue by the direct application of the cryogen makes the procedure safe, efficient and fast. The freezing temperature will destroy cells in the target tissues, the accuracy will avoid destruction of adjacent healthy tissue and a powerful method of application will allow the veterinarian a rapid penetration of the targeted lesion. 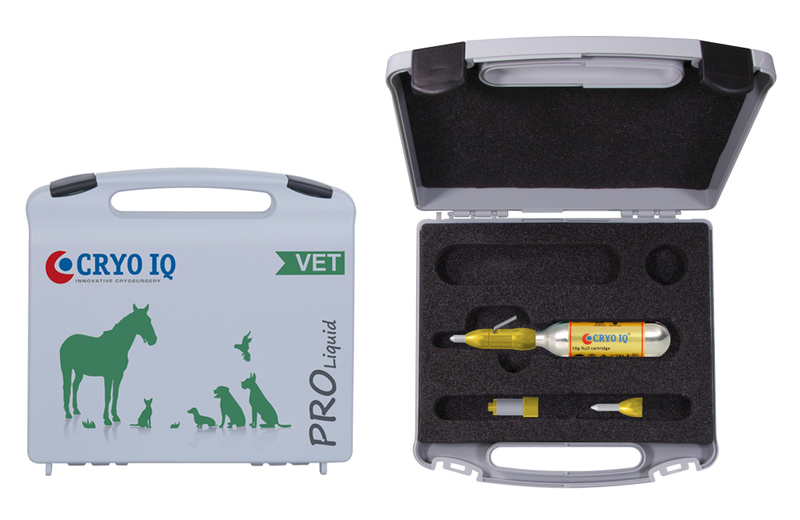 The compact, portable CryoIQ® hand-held device uses Nitrous Oxide cartridges as a cryogen with a freezing temperature of -89°C/-127°F and once punctured the Nitrous Oxide is delivered with a 50 bar (725psi) pressure to the lesion which allows the veterinarian a fast and effective treatment. The CryoIQ® gives the veterinarian the ability to control the width and depth of a skin lesion treatment using various types of applicators and for every 5 seconds of freeze the skin will be penetrated 1mm in depth, to a maximum of 5 mm. The CryoIQ® offers the feature of using 2 different freezing methods which enhances the treatment options for the veterinarian. Liquid Freezing – provides mm precision freezing to the treatment site through micro capillaries. Contact Freezing – closed tip applicators are cooled off by the nitrogen before placing onto the lesion for a hassle-free contact freezing. The tissue and surrounding blood vessels freeze which causes its own numbing, making it practically painless and bloodless. Lower risks of complication, less pain and quicker healing. Cases: All configurations will be delivered in a practical storage case. The CryoIQ® Pro Basic has a fixed applicator capable of accurate liquid spray freezing of skin imperfections with no destruction of adjacent healthy tissue. The Pro Basic offers 2 choices of fixed standard dermatology applicators, 10mm length, with different spray coverages. The CryoIQ PRO with interchangeable spray and contact freezing applicators. The product has the choice of the use of 16g or 25g Nitrous Oxide cartridges.